I love sewing, I really do. I love how I can be stood on the escalator on the tube minding my own business a girl walks past and I spot her skirt in a lovely shape and colour, which sets me off dreaming about the endless variations that I could make. I love how it gives me ideas of how to reuse something I no longer wear rather than chucking it in the bin. I can finally appreciate the quality of an item of clothing, how it should fit me properly and the effort it takes to make something. However, I am by no means such an accomplished pattern designer that I can do without the use of patterns. In fact I love patterns, whether they are vintage, indie or modern. What I hate is the price. I don’t understand why prices have to be so astronomical in the UK. Ladies and gents blogging in the USA rave about the regular sales at JoAnn’s and other stores where patterns can be found for 99 cents! What’s that you say? Why don’t you buy your patterns direct from the US? Well, I would, but you see I get charged a ridiculous rate of $20 (for 2 patterns) from somewhere like Club BMV. Does it really cost $20 to package two lightweight patterns into an envelope and ship to the UK? In addition to this, if I get carried away and spend over $18, I am further penalised with importation tax. So after all this, I am actually better off buying those 2 for 1 patterns…. 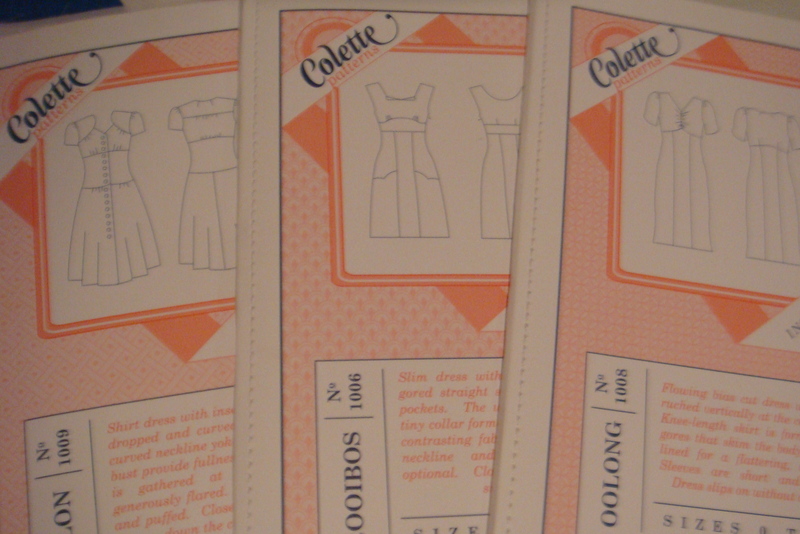 Then there are the independent online retailers stocking my favourite patterns – Colette Patterns. When I look around I feel like some sort of price-fixing game is going on. All the retailers (at least here in the UK) are all selling them at the same price either £10 or £12 depending on the pattern. Colette patterns charge roughly $8 to $9 wholesale per pattern. Their recommended retail price is $16 to $18 respectively. That’s 50% profit. I understand that if you were to sell them in a shop you would need a higher profit margin as you have higher overheads than an internet company. So why is this not reflected in the price of online retailers. What my two pennies worth amounts to is that surely if you market your product competitively by lowering your profit margin, in the long run you will sell more stock, more profit and those customers might also look at some of the other things that you are selling and buy that too. Essentially, all this sums up my antipathy towards buying haberdashery, fabric and patterns. Whilst I love the act of buying and coming home with something exciting. I can’t help but feel ripped off. It is hardly encouraging to new sewers or people interested in crafting when prices are so exorbitant and off-putting. John Lewis or big department stores are where a beginner might traditionally wander into because they aren’t particularly threatening and fairly friendly. Indeed when I first started sewing I bought most of my things there because I didn’t know where to go. But their prices aren’t exactly enticing… I realise that part of the reason notions and patterns in the US are much cheaper is because there is much much more in demand there. However, if we don’t price things more affordably, how are we going to encourage more people to get into dressmaking/quilting/crafting? Susannah from CargoCultCraft showed a simple price comparison between snap fasteners in the US and UK. Yes, its Central London but I think £5.88 for a few snap fasteners is a little nuts too. I don’t like it but living here means I have to put up with that. Even Nancy K commented on the ridiculous prices in Europe comparing what Sigrid would usually pay for a zip in Holland and what it costs in the US. Even in my local haberdashery, it’s not unusual for me to walk out of the shop having paid £30 to £50 for what amounts to a few buttons, thread and bias binding. This is also the shop where one of the sales staff told me ‘we don’t stock silk organza, it’s too pricey for our customers’. The irony is not lost on me. Do you agree? Have you been shocked at the difference in prices between the UK and USA? Do you think shops should be more competitive and discount more? Where do you go to buy cheap supplies? 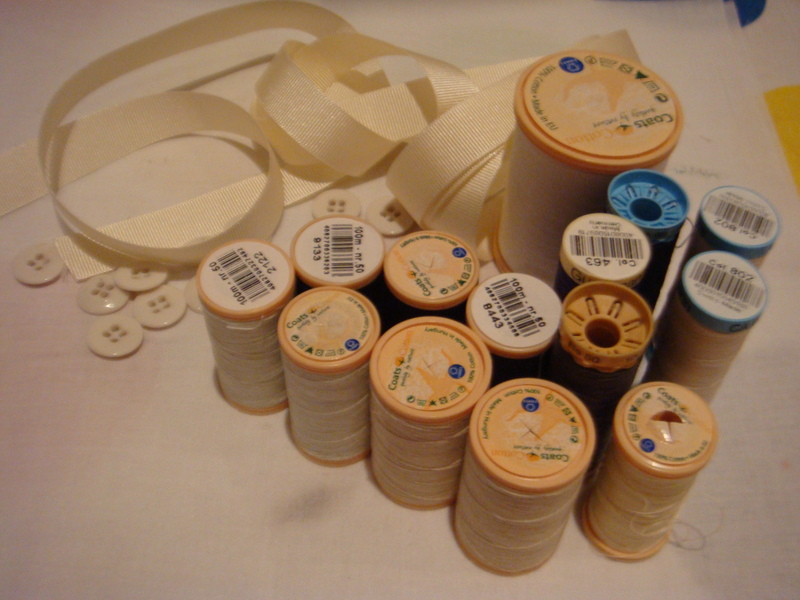 « How to Get Your Sewing Mojo Back if You Lose It! Hi, this is Sarai from Colette Patterns, and thanks for the kind words! I can imagine the frustration of these things being more expensive in Europe. I thought I’d throw in something you may not have considered, though… retailers who stock our patterns also have to pay to import and ship them from the US, and these costs can cut significantly into profit. This is especially true for the smallest retailers who can’t afford to order a lot of inventory at once. It’s a tough problem all around, I think! I agree, it is certainly a tough problem all around. Especially as prices here in the UK will be increasing in January with an increase in VAT (sales tax) to 20%! I think when it comes to selling products from small independent companies there really is no easy solution, as prices will inevitably be higher as their costs of manufacturing/overheads will be higher and they need to try and recover that cost. So I was wrong to compare completely different parts of the pattern industry because they will always be incomparable. I don’t think you are wrong necessarily, because to a consumer price is price, whether the company is big or small! But this is why smaller companies (and I include myself, other independent pattern companies, and tons of other small creative businesses) don’t try to compete on price. Instead, we compete on quality, craftsmanship, style, and really caring about our customer’s experience. So that is a good thing for the consumer in the end. Sorry, a bit of a tangent, but I thought you raised some great points. This article really gets to the heart of what often makes sewing in London a not-very-appealing prospect financially. 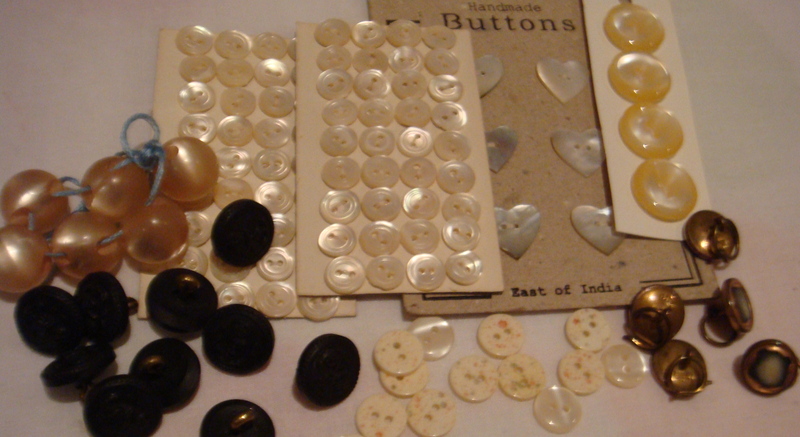 It’s one thing to throw some vintage buttons on a dress when they cost $2; it’s another when they cost £20. (Yes, I have seen a London shop ask this much for a bog-standard card of vintage buttons.) For the same reason, I don’t buy very many modern patterns — at £5-£10 a pop including shipping, I don’t have the luxury many seamstresses elsewhere have of buying modern patterns on spec. I don’t buy new patterns unless other people have tested and reviewed them and I’m sure I’m going to make them up. 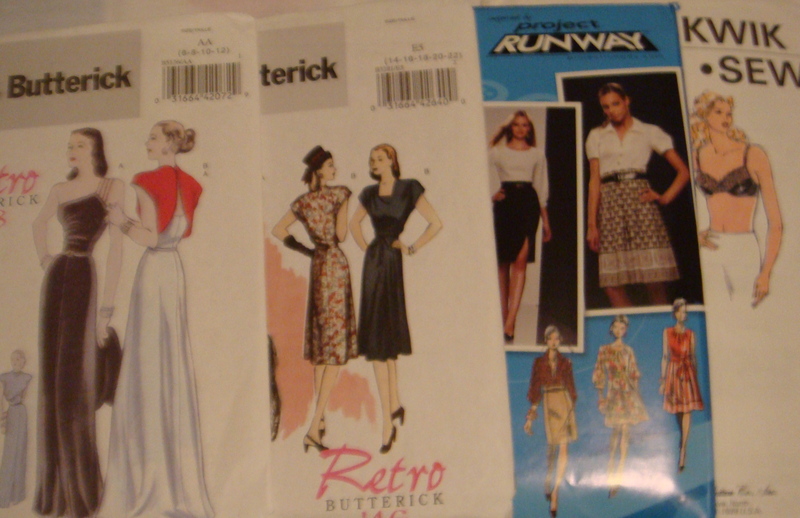 I buy a lot of vintage patterns, fabric and haberdashery direct from the States through websites like Etsy or eBay. I find buying from individual sellers yields the best shipping rates because they are more willing to ship at or near cost than bigger companies, which may often apply what seem like unreasonably high flat rates ($20 and up) even to ship a single paper pattern. Since items under £35 in value don’t incur customs charges, it usually works out much cheaper, even with international shipping, to buy from the States or Australia than to buy in London from shops like MacCulloch & Wallis or John Lewis. Assuming a similar product is even available in the UK, and most vintage stuff is not. I would love to shop locally but usually the price, service and selection in London just can’t compare. I buy from UK retailers when it makes sense to do so — when speed is more important than price, when they have a one-of-a-kind item, when I have to see the product in person before buying or when buying abroad would be prohibitively expensive. Otherwise my first instinct is to shop online from overseas retailers. It doesn’t seem like much of an ethical dilemma as most UK retailers import all their merchandise from abroad anyway. I LOVE using made-in-Britain fabric, but at £20-£80 a metre, it’s not often a realistic possibility. If it makes you feel any better, the prices for fabric and patterns aren’t much better in Canada and the shipping from the US really isn’t that much more (sorry, Sarai!). Commercial patterns from the Big 4 are cheaper than what I expect you pay in Europe (around CAN$10-12), but I’ve never seen them on sale for less than CAN$3 (which is US$3). Fabric especially is much more expensive than what I see US bloggers snagging it for. However, in Canada, we have fairly stiff textile tariffs which adds quite a bit to the cost. However, locally made fabrics can be VERY expensive. Most people I know don’t sew, but you’d be surprised by the number who, due to the cost of suits and other tailored clothing here, if they happen to be in Asia will make a point of finding a tailor to make suits for them. The prices can be one tenth of the cost of a comparable suit in Canada. (Many people in Canada have family in Asia and the flights can be inexpensive if you get a good sale.) To get around the cost of bridesmaids dresses, a friend of mine went to India (to attend a wedding and visit her fiance who was working there) and bought saris at a fraction of the price. The economics of textiles are difficult though because only certain places in the world have thriving textile industries and bolts of fabric are heavy which makes shipping more expensive, adding to the end consumer’s costs.